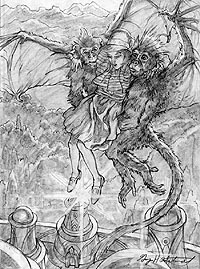 In this wondrous scene of the winged monkeys carrying Dorothy off to Oz, the Wicked Witch is dead, and that there is peace in the land. Dorothy's face is alight with excitement, and she knows she will soon return home! This was a concept illustration for the first printing of Greg's illustrated classic of "The Wizard of Oz." The published sketch was altered slightly–showing a different background and slightly different facial expressions. In the second printing of this book, Greg actually painted the scene so readers could see it in full, beautiful color! In 1900, 'The Wonderful Wizard of Oz', written by L. Frank Baum, was first published. The movie adaptation, 'The Wizard of Oz', was released in 1939 -- the year Greg and Tim Hildebrandt were born! Greg and Tim first saw the movie at age 7. Greg vividly remembers being terrified of the Wicked Witch of the West! Of course, we all know how much kids enjoy a good scare, thus making the Wicked Witch one of Greg's all time favorite villains! In 1985, Greg was asked by the editor of Unicorn Publishing to illustrate the Wizard of Oz as his next classic in Unicorn's Heirloom Series. So there he stood, 46 years after seeing the movie, terrified yet again. As an artist, illustrating Oz was a great challenge. Greg wanted desperately to do the art, but at the same time he needed to make sure that it was HIS Oz as he saw it. He did not want any relation to any other illustration done before his, and especially did not want to be associated with the film. Greg spent almost a year working on the art for the illustrated edition of Oz. Most of us know illustrated classics by the movies we see. Most of us have never read an original edition, so it was very important to Greg to choose scenes that no one would know existed in Oz. He had great fun depicting the different versions of the Great and Powerful Wizard of Oz, the Army of Oz, the Quadlings, and the China Clown. One of his favorite paintings is of the witch melting. To this day, the Wizard of Oz is one of Greg's favorite classics.